While we didn’t get any electrical plans for the house, it appeared that the house was pre-wired for sound. 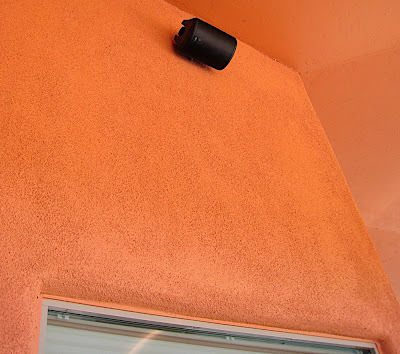 With a multi-meter and some detective work, I was able to figure out that the wires that were sticking out high up on the patio wall were speaker wires and how they were routed to the living room. Our receiver can handle multiple zones, so I mounted some outdoor speakers and connected them to Zone 2 on the receiver. The receiver also does Internet radio, which means we can now stream Pandora straight from the receiver to the patio for some background entertainment – sweet! There is a lot of natural desert where we live. This means there are tons of critters all around us. We were told about javelinas but haven’t seen them yet. We have seen many birds and insects, lots of rabbits, and coyotes. One of the birds you see around here a lot are roadrunners. Contrary to popular belief, they do not go “MEEEEP! MEEEEP!”, produce dust clouds, or hunt coyotes. There is a big brown lizard that lives apparently under our hot tub, but he’s photo shy. 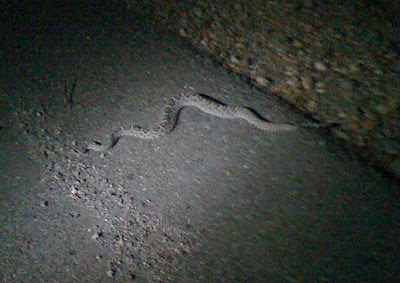 Tonight as we were out for a walk around the neighborhood we saw our first snake. 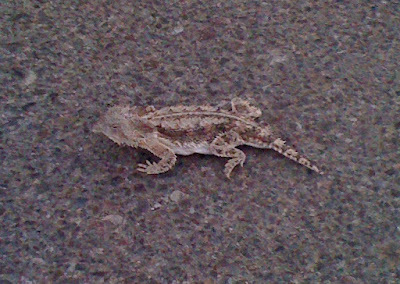 Looks like a young rattle snake, soaking up the heat from the pavement. We recently got the blinds for the house. They are called upside-down blinds, no, bottom’s up blinds, or something like that, whatever. As you can see in the photo, they are pretty cool. You can either lower the top, or pull the bottom up, or both. Last but not least, here is the BBQ island on the patio. It’s got a massive grill, cooler, storage, with nice tile work on the top and matches the house well. We’re looking forward to having a house warming party and putting the grill to good use. Click here for larger versions of the photos.